In a battle of defenses at Nixa, the Lady Eagles finally broke through in overtime to grab a 1-0 victory over Republic Tuesday night. The game-winner game a minute and a half into the overtime period, after Republic goalkeeper Tara Campbell and the Lady Tiger defense had turned in one of its best performances of the season in regulation. Nixa’s score came on a corner kick from Liz Davis, who booted the ball into the middle of the box, where Abby Harrison finished. Before the game-winner, the biggest play of the game was 80 minutes earlier, just a couple of minutes into regulation. Nixa picked up a penalty in the box and had a penalty kick to take the lead almost as soon as the game began. But Campbell guessed right, diving to her left to stop the shot and turn Nixa away. Campbell had several other saves throughout the next 80 minutes, including at least one other diving save. 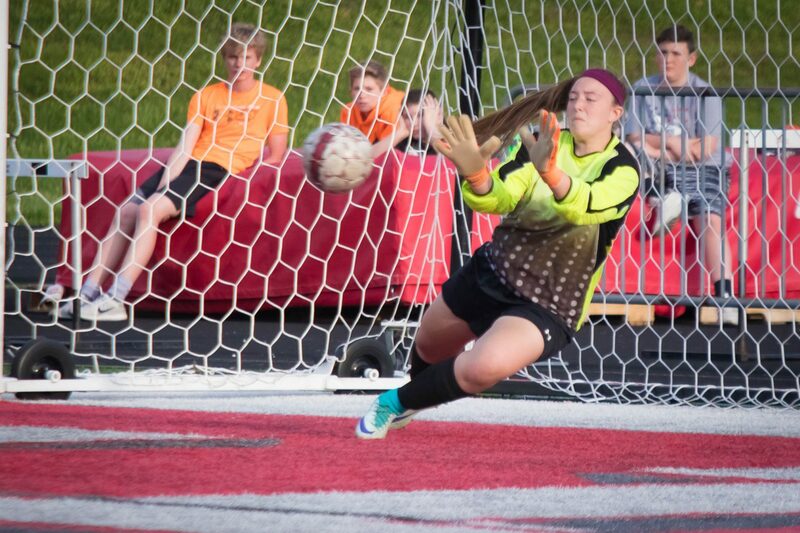 “Tara’s save of the PK at the very beginning…was the game-changer,” says coach Kevin Hauck. “That was a great save right there and gave us tons of momentum. And not just that, but as a defensive unit, whenever Tara made a save again and they played it back in, our defense is there to clear it out again. Nixa and Republic took turns controlling the pace of play for minutes at a time. After a scoreless first half, Nixa pressed forward for the first several minutes of the second half. But the final 20 minutes of regulation largely belonged to the Lady Tigers, and they had several shots on goal, but couldn’t get the ball into the net. Hauck says he saw “tons of heart and tons of grit” from the Lady Tigers, despite their loss. “We were physical, we were aggressive, and that’s what we’re trying to build this year, and we’ve done a nice job of it,” he says. Throughout the game, Hauck exhorted his team to stay aggressive, even after being whistled for fouls. “We were fouling some up high, and I’m okay with that because we want to be an aggressive team, and with being an aggressive team, you’re going to draw some fouls. That’s fine, as long as we kept them away from the box. All it’s going to do is keep [the other team] a little bit cranky, and that’s okay to do,” he says. Hauck says he told his players not to be discouraged by the loss, and to take a lesson from the boys soccer team, who lost a 1-0 match to Carthage during the regular season last fall before winning the game that counted in the district tournament.